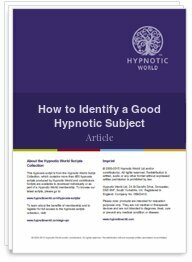 Deciding whether a client may be a good hypnotic subject is sometimes difficult, but outlined in this article are a few hints that you can pick up on that may prove to help determine a person's suggestibility. By asking a few simple questions before you start with the therapy, you can gain valuable insight into your client's mind and how they might respond to hypnotherapy, and can also help to ensure that your client is serious about their treatment. Being able to differentiate between who is likely to be a good hypnotic subject who will respond favorably to just one session of hypnotherapy, and one who will need to be conditioned by reinforcement sessions can make all the difference to your overall success rate as a Hypnotherapist.